At the 10th hour on the 10th day of the 10th month - a minutes silence is given to the Firefighters lost in the Line of Duty and to be remembered in the Annual Commemorative Service across the State. As always I attended St Brigid's to not only photograph the day but to show my respect. As like last year, I am proud to say that because of an "accidental" road trip many years ago, I got to bring home 2 names that had previously been overlooked in the Honour Roll. Today, as I have in the past, when the bell rings summoning the families of firefighters to reflect and pay respects to their missing colleagues, I will shed a tear knowing that I both both these names home to be honoured. May all the Firefighters who have departed before us and their families always be remembered in our thoughts and in our prayers, for they are the ones who have paid the ultimate sacrifice to the community in an effort to protect the lives and property of others. The bell used in this service is the same bell that was used in the bell tower of the Ithaca Fire Station on Enoggera Terrace. The bell was used to summon firefighters to the station to respond to fires in this area. Today the bell is used to summon the spirit and the memory of fallen firefighters, their families, their friends and their colleagues to pay respect for their service. The wreaths laid today will be laid at the Firefighters Memorial by operational crews. 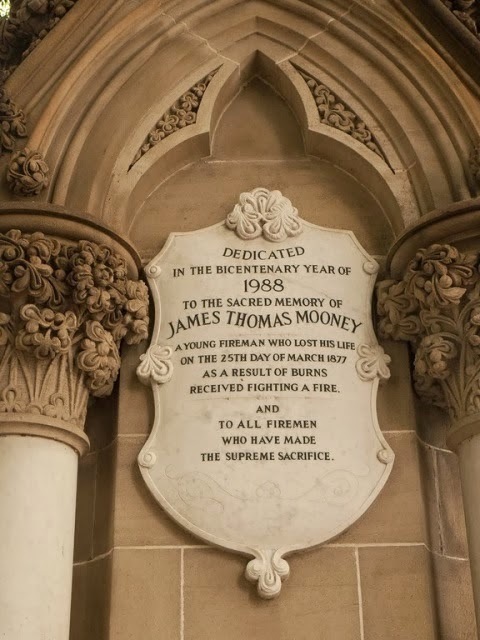 The Memorial is named the James Thomas Mooney Memorial in honour of the first recorded Queensland firefighter to lose his life in the line of duty.